Samurai Pizza Cat DVDs Are Coming! Who do you call when you want some pepperoni? Apparently, a little company called Discotek Media! Crunchyroll made many an old school anime fan squeal with glee when they released an article saying that Discotek Media announced they will be releasing Samurai Pizza Cats on DVD! Apparently, it will come in two versions: an English dub, and the original Japanese language track with English subtitles. 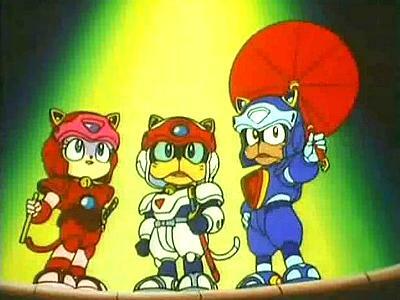 For those who don’t know what Samurai Pizza Cats is, well, I feel damned sorry for you. This show was a big part of my childhood, and my little brother and I still sing the theme song to each other every now and again. I will be picking up the English dub. Why? Well, to be honest, it’s fricken’ hilarious, and I can’t imagine watching the show without all of the jokes I remember from my childhood. I’d love to know who else is excited about this, and what version you guys will be picking up. I’m assuming that a DVD release means that I’m far from the only person who remembers this gem of a show. I hope you all are as excited as I am!